One of the most exciting things about being a bartender is that the skills you have learned can be used in every country in the world. Bartending is a universal skill that can open doors to unlimited possibilities. Many of the students that have taken the training program at Fine Art Bartending have gone on to travel the world, paying their way with work behind the bar. Employers in many countries like North American trained staff because they understand service and that the customer comes first. In societies where tipping is not common, working behind the bar is not a desired career choice which results in unhappy and curt bartenders. Managers want customers to feel welcome and happy as they walk in the door. You are going to want to get a holiday travel visa before you leave. Don’t wait until the last minute. Get started on this at least 2 months in advance in case you make any mistakes with your paperwork. You will have time to correct them before you leave. A working holiday visa is a travel permit which allows travellers to undertake employment in the country issuing the visa for the purpose of supplementing their travel funds. Most working holiday visas are offered under reciprocal agreements between certain countries, to encourage travel and cultural exchange between their citizens. Get medical insurance! Being young doesn’t make you indestructible. Getting gravely ill is common and can happen to anyone. Vehicle safety standards aren’t the same as back home. Even sidewalks are not built the way you might expect them to be. You can step in a hole, get hit by a car, or even slice open your foot on a broken bottle left on the beach. Some countries might be very cheap to get medical help, but just in case a little extra insurance goes a long ways to easing your parent’s mind. That extra insurance can also make sure you aren’t spending all your savings on fixing a broken ankle. Study up on where you are going. Learn some of the language. Chat with people that have travelled there before. Every person travels differently and has different experiences while in a far away land. Knowing a little about where you are going will really help get you off on the right foot. Neighbourhoods and transportation options are really easily researched now with the web. Be sure to bring several copies of your resumes along with your certification. It is really just a matter of applying. You will find that most places that cater to tourists are very welcoming of a “guest” bartender from another country. Make sure you are dressed well, clean and be confident in your ability. Always speak to the manager and never just drop off a resume. Ask to work a shift for free so they can evaluate you. 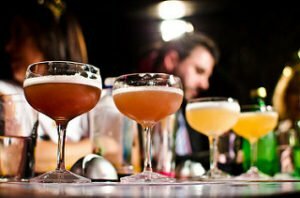 These are great tips and if you follow them you will be successful at getting that bartending job in another country. Look at picking up shifts in a couple different places. Bartenders are loved everywhere, and word of a knowledgable cocktail mixer does get around town fast. You will meet more people and learn much more about the area from the staff than you ever could just researching on your own. Join us for our 32-Hour Bartending Course and our instructors will share a pile of stories from them working as bartenders across Canada, the US, and around the world. We also have a very well travelled group of teachers too, so they might share a few of their stories of what they have seen in different parts of the world… either as bartenders or just patrons enjoying a beer or cocktail.